Niagara Falls is famous for many things. Of course the famous waterfalls are the top attraction but there is much more going on in this little part of the world. Families visit to enjoy the fun and games their kids love, honeymooners are always going to be a fixture, and Niagara is becoming more popular as a destination for conventions and corporate retreats. 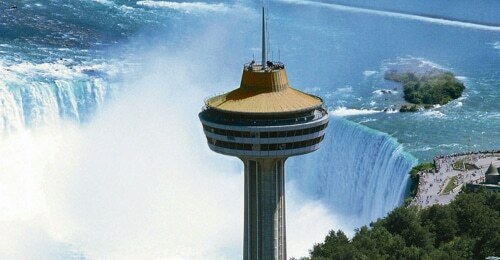 However, one aspect of the Niagara Falls experience might be overlooked and that’s its world-class cuisine. At first glance one might be under the impression that Niagara offers only fast food and chain restaurants but hidden behind the neon signs is a growing community of talented chefs who are dedicated to their craft and to bringing Niagara’s exceptional dining to light. By utilizing local ingredients whenever possible, creating delightful and innovative menus, and tapping into the vintner community to source fine, local wines these chefs and restaurant owners are putting Niagara on the foodie map. And the best place to find these impressive eateries is in the conveniently located Fallsview area. Steak lovers are in a class of their own and will settle for nothing less than a perfectly cooked and seasoned steak. When exploring the Niagara Falls dining scene The Keg Steakhouse and bar is not to be overlooked. Located in the Embassy Suites Hotel, the Keg not only serves up some of the best steaks in town but it also boasts a stunning view of the falls. In addition to their beef, a few must-try items on the menu are the escargot with mushrooms and the cheesecake. 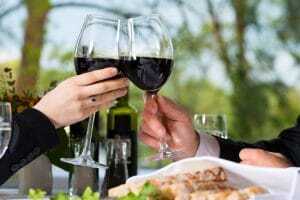 Of course, they offer all the side items you’d expect with a steak and their waiters are ready to help you choose a wine that pairs perfectly with your meal. Massimo Capra is one of Canada’s most celebrated Italian chefs and he’s taken that talent to The Rainbow Room in the Crowne Plaza Hotel. The menu is a creative blend of traditional Italian favourites and local ingredients that compose dishes that will not only pique your taste buds but also just might make you a repeat customer. Also with a lovely view of the falls, The Rainbow Room features local and imported wines that the staff can help you decide upon. The chef also hosts regular dining events focusing on specific regions of Italy and the cuisine that originated there. Check their website for these events and plan your trip accordingly. If you want to experience the true nature of Niagara’s agricultural bounty and dine in an exceptionally luxurious setting then AG at the Sterling is the place for you. As one of the most unique restaurants in the city, Chef Cory Linkson personally oversees the growing of all produce and herbs on his own farm and each item is picked in the morning and lands on your plate that evening. Each item on the menu is appealing, but some of the standouts are the winter carrot velouté with red curry and coconut milk and Lake Huron whitefish with beets and puree of celery root. As one would expect, the wine list is as elegant as the menu and features a wide selection of local wines. If you can only choose one restaurant in the Niagara Falls dining scene this is the one. For something completely different and quintessentially Niagara Falls the revolving dining room at the Skylon Tower is an experience you won’t soon forget. In addition to the incredible views of the falls as you slowly revolve in a complete circle the menu and the wine list are both strong enough to rival the scenery. One of the standouts on the starter menu is the duck pastrami with a mustard sauce and you can’t skip the rack of lamb on the dinner menu. Exquisite desserts will also tempt you and wine suggestions accompany each dish on the menu. However, you can always ask you server for suggestions. 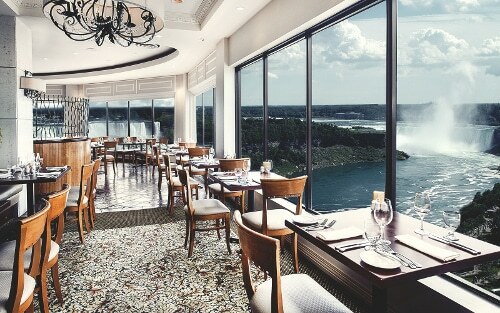 Situated on the 13th floor of the Sheraton on the Falls hotel Windows by Jamie Kennedy is one of the most celebrated restaurants in Niagara Falls. Another proponent of the farm-to-table movement in the area Jamie Kennedy has created a menu that is simply stunning, created a team of experts to assist him, and the view of the falls is not to be dismissed. Choosing your meal here is incredibly different as everything is near perfect. However, the Prince Edward Island mussels appetizer is an excellent choice as a starter as is the mac and cheese with chorizo and diver scallops. For your entrée, the mushroom gnocchi with romesco sauce is earthy and comforting and the beer braised Ontario lamb shank will satisfy in ways you never thought possible. 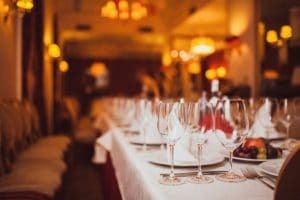 As the Niagara Falls dining scene continues to draw attention from food lovers, critics, and other chefs we can expect to see this trend expand, which is great news for all visitors to Niagara Falls. In the meantime, choose one of these Fallsview area eateries during your next visit and see for yourself what everyone is raving about.